When you talk about art, doyou ever think of light? How about wedding and event venue uplighting? Bay Area wedding and event venue uplighting is not just light, its art on the walls, dance floor and any other aspects of uplighting. These artists of event décor and up-light and creators of ambiance are known for making your wedding venue a WOW experience. Venue Up lights and lights are not just the lighting , it’s not just illuminating the wedding or reception venue or banquet hall , and it is not just a job for the maintenance person to just the dim lights . We at iDesignEvents skillfully combine up lights, spotting, pin gobos and decorative wall washes thus transforming the dull venue or wedding banquet hall to magical ambiance! iDesignEvents serving all of the Northern California, including Sacramento, San Jose, East Bay and all of the Bay Area. 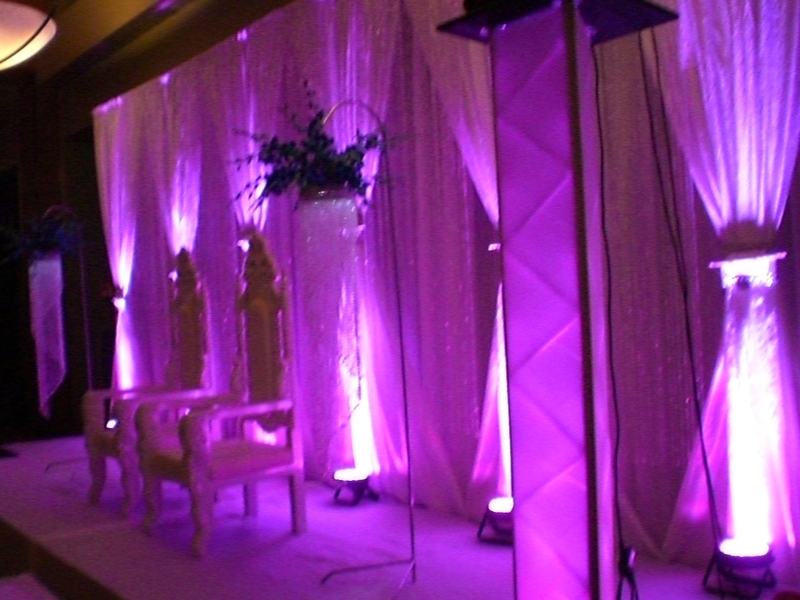 Some of our services include but limited to Centerpiece Lighting. state of the art portable powered led light discs, size of eight inches to 4 inches wide, that can be placed underneath decorative items like centerpieces, buffet displays, photos, vases and other décor on the table. These led powered lights project from underneath and can be set to any color or vary from one color to another. Centerpiece lighting is a great way to highlight centerpieces on your table and add warmth and color into the room above and beyond traditional candles. The LED lighted plates help your flowers shine and your guests see the decor and elements at each of their accented tables. Works really well in conjunction with candle lighting and other decorative elements. Especially if you love the glow “WOW” effect on your wedding and or reception.